I’m always genuinely intrigued when a film comes my way from a first time director - especially if he/she is British. This time it’s Toby Wilkins. 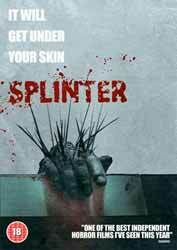 The marketing release cites Splinter as having won numerous genre awards, but in actuality it really isn't that special. All four of the main characters are pretty much stereotypical, particularly the gun-toting escaped convict who starts out understandably selfish and confrontational before becoming instrumental in the group's prolonged survival and even their sacrificial saviour. The anti-hero is not a new idea. The westerns of Howard Hawks would often feature one, and ever since John Carpenter's original Assault on Precinct 13, many films such as Con Air have adapted the concept. As for the film itself, potential so often rears its head only to disappear from trace equally as quickly. The idea that the parasitic symbiote can only detect its prey/potential host by detecting a heat signature it essentially sound, and so it makes sense for the survivors to secrete themselves in the garage's freezers. When the thought that a decoy heat source could be a good distraction and maybe help them to escape, instead of setting fire to something to create a constant heat source instead they light fire crackers which flare, fizzle and die-out within seconds. Although making no sense whatsoever, it does make for a suspenseful few minutes while one of the characters tries to make it to the car outside. The most annoying omission for me is the lack of explanation for the monster of the piece. Is it genetic anomaly, evolutionary leap, or of extraterrestrial origin? A competent enough offering, entertaining in places, but offering little in the way of originality or informative exposition.